The clients had a lofty goal for a small project: to absorb the neighborhood’s water passing through their yard on its way to the Chesapeake Bay. Set on a slope, this 1953 house had tree-house views but limited garden access. Consistent with mid-century suburban development patterns, the house, driveway, and yard were arranged without regard for the site’s ecological patterns. A heavy volume of water periodically flowed over the driveway and yard, running into nearby Rock Creek and, ultimately, the Chesapeake. 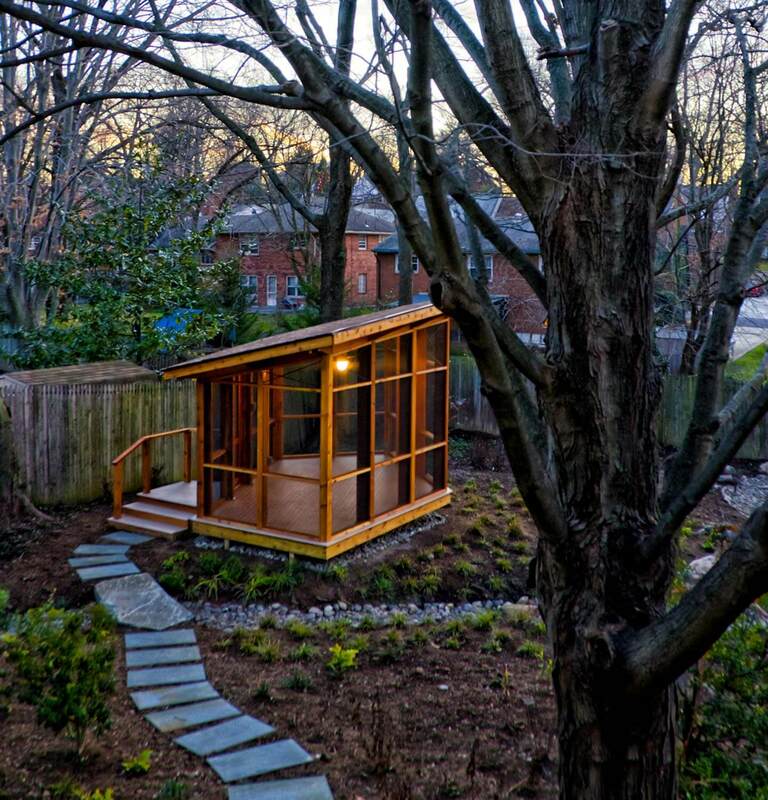 With this garden redesign, the current owners, both employees of an environmental agency, committed to applying low-impact-development practices at home. Systems tactics, spatial tactics, and program tactics overlap and reinforce each other in the project’s design. A pre-existing but hidden channel was unearthed and developed into a new bioswale. The new rain garden comprises both this channel and an “infiltration” garden designed to hold water before it leaves the site boundaries. The architect and landscape architect collaborated on all elements to create a shared design language that creates a cohesive experience. 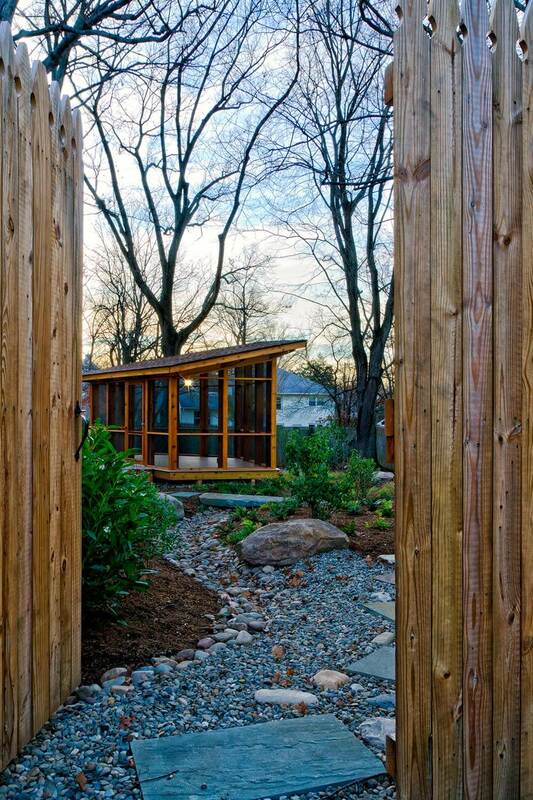 Runoff from the pavilion’s roof goes directly into the swale, integrating the structure with the rain garden’s mission to restore the streambed meandering through the backyard. Shrubs, groundcover, paving and earth that the project displaced were reused on site. New pavers, stones, and gravel came from local rivers and quarries. Native plants are featured prominently in the design and all work was done by hand. 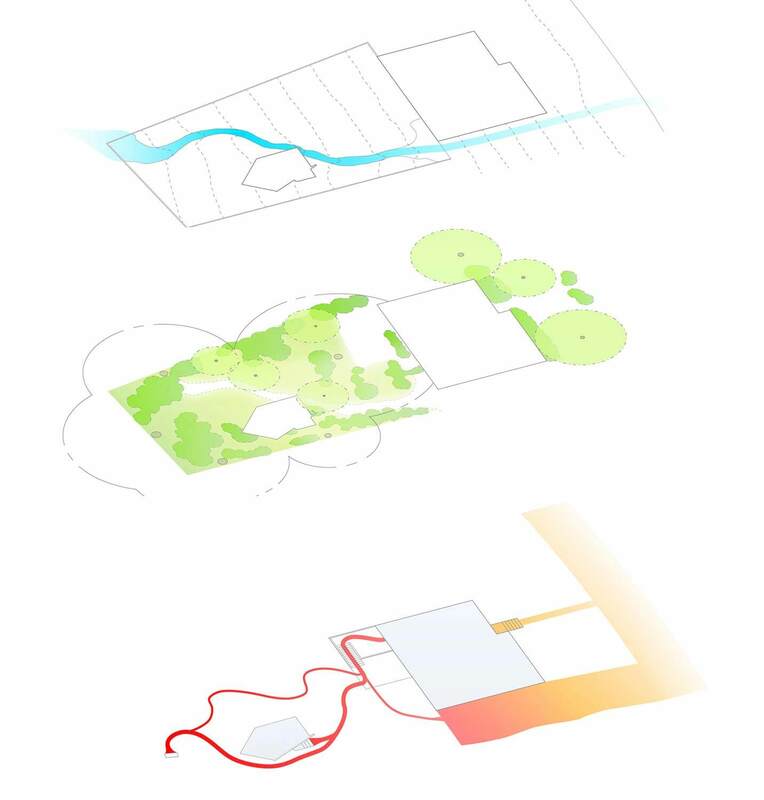 Ultimately, the architecture becomes a small moment that humbly enables human inhabitation within a larger hydrological system design.